Our January/February issue is finally out–sent to e-subscribers a couple of days ago, and in the mail to print subscribers. We most recently posted David Bacon’s contribution to the issue, What Trump Can and Can’t Do to Immigrants, especially timely given Trump’s recent executive orders. If you’ve just awakened from a Rip Van Winkle-like sleep, you should probably stay lying down for a little while. You’re in for a shock. A presidential candidate who slandered Mexican immigrants as criminals and rapists, claimed a Mexican-American judge was inherently biased against him, called for a ban on Muslims coming to the United States, called for compulsory registration of Muslims in the country, boasted of sexually assaulting women, insinuated that gun advocates might assassinate his opponent, and pledged to abide by the election result “if I win” … was elected president. The leading figures in the mainstream of the Democratic Party certainly did not expect an adversary raging against corporate globalization (even with the anti-Semitic dog whistles audible in Trump’s denunciations of the “global elite”). For decades, leading Democrats had bought into the neoliberal economic agenda, steering away from policies that could get them branded as “anti-business.” They derided criticism from the left as juvenile and quixotic, not dreaming that they would be outflanked on the right by a populism like Trump’s. The analysis by liberal and progressive commentators since the election has focused largely on why Trump won and what it says about the country. We have to remember, however, that election results are not revelations of the national soul—especially not under the United States’ non-majoritarian presidential election system. The overt racism, nativism, and misogyny of Trump, his allies, and supporters are important facts about the United States today, but they are not the singular truth about the country or its people. Yet there is nothing to be gained by minimizing what Trump has conjured. He tapped into widespread sentiments of grievance in a manner typical of right-wing populists: simultaneously directing his supporters’ ire at (some of) the wealthy and powerful and (some of) the poor and marginalized—blaming both, jointly, for the ruin of the country. The people Trump speaks to and claims to speak for are overwhelmingly white, predominantly male, and the grievances to which he gives voice are not simply those of workers and poor people in general. They are, rather, the particular grievances of those who recoil at gradually sinking into a mass they see as beneath them. The articles in this issue attempt to dig deeply into both what has gotten us to this point, and what are possible ways forward. 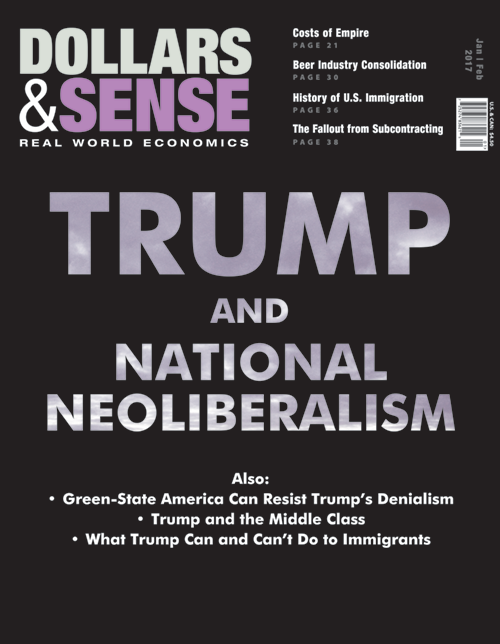 Our cover article for the issue, by political scientist Sasha Breger Bush, argues that what we’re seeing is not the end of neoliberalism, but rather its transformation, from globalized neoliberalism into “national neoliberalism,” and its culmination: a corporate capture of government now more complete than ever. Steve Pressman and Gerald Friedman both add depth to our understanding of Trump and what he represents. Pressman explains Trump in light of the squeeze on “middle class” incomes and the rise of economic inequality. Friedman adds to his previous analysis of American nativism (the November/December 2016 cover story) an “Economy in Numbers” on U.S. immigration in the current era. David Bacon and Frank Ackerman, meanwhile, turn from retrospect to prospect. What does the coming period hold in store? Bacon focuses on immigration policy, noting the constraints under which a Trump administration will operate. Even in an era of increased border enforcement and deportations nationwide, Bacon argues, immigration policy will continue to be driven by employers’ need for a cheap and controllable labor force. To be sure, there will be many struggles ahead. Time to arise.